The importance of entering higher education is well known and having the necessary qualification in a specific field will place a person above other candidates when it comes achieving the job they desire. However, gaining qualifications comes at a price financially with students not only having to pay tuition fees but also paying for accommodation and living costs. To cover such expenses, the natural thing to do is apply for a student loan. Up until September 2012, the tuition fees charged by universities were generally around £3,000. After this date, universities have been given to option by the government to increase their tuition fees up to a rate of £9,000 for full-time students. This means that a student attending university in, or after, September 2012 may be required to pay triple the fees of a student just one year older. With such a dramatic increase in tuition fees, the requirement of student loans grows ever more important. Should you get a student loan? For students, loans are very accessible and have the benefit of much lower interest rates than other types of loan. A student loan is also unlike regular loans in the fact that it is not classed as ‘debt’ in a way that will adversely affect a credit rating. That being said, a loan of any kind is a large financial commitment and serious consideration will need to be taken. Whether or not you need to take out a loan will depend on your financial situation. Loans for students can be used to pay tuition fees or accommodation and maintenance costs. If you have a part-time job or are able to get through university with the help and support of family, you may not need a loan. If you do not have a job and do not wish to burden a family with what is an expensive financial commitment, a loan may be the most beneficial solution. Student loans are provided by the Student Loans Company (SLC), a non-profit making organisation set-up by the government to provide loans to students in universities and colleges in the UK. 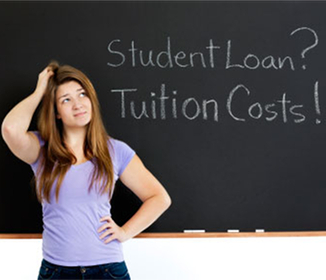 There are two types of loan available to students: a tuition fee loan and a maintenance loan. The tuition fee loan is available to every student and will provide you with enough money to cover tuition fees but nothing else. The maintenance loan is also available to all full-time students but is provided on a “means-tested” basis. This means that the amount you are able to borrow is determined by the income in your household. For example, a student living in a household that has a combined annual income of £20,000 will receive a bigger loan than a student in a household that earns £50,000 annually. The maintenance loan payment is provided at the beginning of each semester (September, January and April) and helps to cover day-to-day living expenses such as rent, food, and travel. If you are thinking about the ways you can possibly finance your higher education, a good step forward is to actually find out what financial support is available to you using the student loan calculator. There are various different types of financial aid available to students; such as loans, grants, scholarships as well as bursaries. If you are a student from England, the student loan calculator, found here, is an excellent tool that uses the information you provide to give you an estimate of the amount of money you could receive. Student loan repayments will depend on when you enrolled in university. For students with loans that were studying between 1998 and 2011, the repayment will be 9% on everything earned over £15,000. The interest rate on the loan is calculated in one of two ways; either by the rate of inflation, or by the Bank of England base interest rate, plus one per cent. The lowest figure of the two is used. So, for the year September 2011 to September 2012, the interest rate on student loans is the Bank of England base rate (0.5%) + 1% = 1.5%. For anyone enrolling in university on, or after, 1 September 2012, the amount they are allowed to earn is increased: 9% on everything earned over £21,000. However, the interest rate will be worked out differently. In this case it will be the inflation rate for the year plus 3%. You will stop paying a student loan when your income falls below the set threshold. If you graduate and, for the next two years, don’t get a job that pays more than £15,000 or £1250 a month, you won’t pay back the loan. However, while it is not being repaid, the ‘debt’ will continue to increase. Debts from student loans are wiped if you pass away or are unfit to work. Students that started between 2006 and 2011 will have their debts wiped after 25 years (35 years for Scottish students). This will increase to 30 years for students enrolling from 2012 onwards. When taking out a loan, students will be provided with a yearly summary of repayments from the Student Loans Company. You will also be provided with an online account that can be logged in to at any time for an overview of loan status and a phone number that can also be used to access information. Any person that has graduated and entered employment on the PAYE scheme will have the monthly repayment automatically deducted from their wages. Those who are self-employed have to make specific arrangements to repay. Look at your financial situation and decide if you need to take out a student loan. Apply to the Student Loans Company (SLC) – the earlier the better. If you accept, you will normally receive payments in September, January and April. Reapply each year (if necessary). You will usually be contacted by the Student Loans Company (SLC). When you graduate/finish University and start earning over the threshold, you will begin to make repayments towards to your loan. Keep on top of your finances at all times. Always be aware of what you owe and how much you are paying.